There’s a new piece of data on MapIt, and it wasn’t added by us. It’s tiny but useful, and it’s slightly esoteric, so bear with us and we’ll explain why it’s worth your attention. 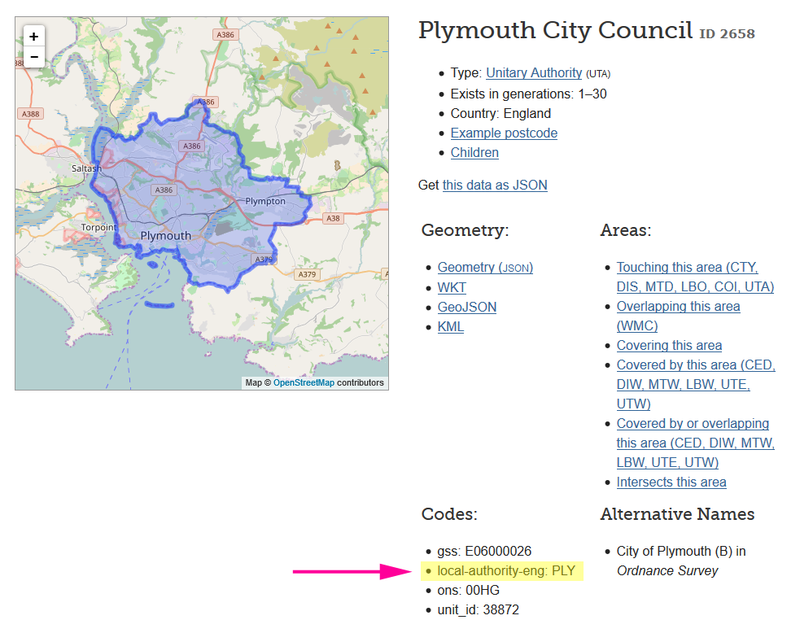 Local Authority codes come from the government’s set of canonical registers. They may not look much, but they’re part of a drive to bring consistency across a wide range of data sets. That’s important, and we’ll try to explain why. If you try to buy a train ticket to Gillingham in the UK, and you are lucky enough to be served by a conscientious member of staff, they will check whether you are going to the Gillingham in Kent (GIL), or the one in Dorset (GLM). The names of the two towns might be identical, but their three-letter station codes differ, and quite right too — how, otherwise, would the railway systems be able to charge the right fare? And more importantly, how many people would set off confidently to their destination, but end up in the wrong county? I mention this purely to illustrate the importance of authoritative, consistent data, the principle that is currently driving a government-wide initiative to ensure that there’s a single canonical code for prisons, schools, companies, and all kinds of other categories of places and organisations. Of particular interest to us at mySociety? Local authorities. That’s because several of our services, from FixMyStreet to WriteToThem, rely on MapIt to connect the user to the correct council, based on their geographical position. I live within the boundaries of Brighton and Hove City Council. That’s its official name, but when talking or writing about my local authority, I’m much more likely to call it ‘Brighton’, ‘Brighton Council’, or at a push, ‘Brighton & Hove Council’. All of which is fine within everyday conversation, but which is an approach which could cause mayhem for the kind of data that digital systems need (“machine readable” data, which is consistent, structured and in a format which can be ‘understood’ by computer programs). The two examples above go some way towards explaining why the Department for Local Government & Communities, with Government Digital Services (GDS), are in the process of creating absolute standards, not just for councils but for every outpost of their diverse and extensive set of responsibilities, from the Food Standards Agency to the Foreign & Commonwealth Office, the Land Registry and beyond. Where possible, these registers are published and shared as Open Data that anyone can use. It’s all part of GDS’ push towards ‘government as a platform’, and in keeping with the work being done towards providing Open Data throughout the organisation. Where possible these registers are openly available, and can be used by anyone building apps, websites and systems. And now we come to those Local Authority codes that you can find on MapIt. Like most mySociety codebases, MapIt is Open Source. That means that not only can anyone pick up the code and use it for their own purposes, for free, but that they’re also welcome to submit changes or extensions to the existing code. And that’s just how GDS’ Sym Roe submitted the addition of the register. If you’re a developer, the addition of these codes means that you can use MapIt in your app or web service, and be absolutely sure that it will integrate with any other dataset that’s using the same codes. So, no more guessing whether our ‘Plymouth’ is the same as the ‘Plymouth’ in your database; the three-letter code tells you that it is. Plus, these register codes identify a local authority as an organisation, or a legal entity, as opposed to setting out the boundary, so that’s an extra layer of information which we are glad to be able to include.